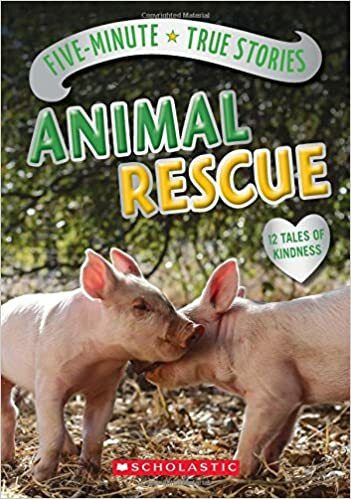 Summary: In this follow up to Five-Minute True Stories: Animal BFF’s, twelve stories tell of animals rescued by humans and each other. 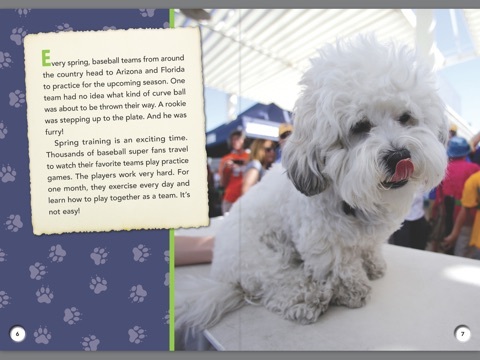 The animals are pets (dog, cat), farm dwellers (donkey, goat, pig), and wild animals (penguin, rhino, bear, wolves, serval), and the rescuers include the Milwaukee Brewers baseball team (Hank, the stray dog they rescued and made their mascot, is pictured above), a donkey, a chicken, and a wide variety of humans. Each story is 12-15 pages long, with large text and lots of full-color photos. 160 pages; grades 1-4. Pros: Sure to appeal to a wide variety of animal fans, these stories are simple enough to engage beginning readers, yet will also undoubtedly find fans in the upper elementary grades. Cons: There are no extra text features (e.g. headings, captions, etc.) or back matter, making this less useful for teaching about informational books.